I've had an Epson WorkForce 630 All-In-One printer for about 3 years, that I have loved. It's been my baby for printing Project Life photos for a couple of years (in between occasional swaps to Walgreens). I had an Epson Photo R300 (still do, actually) when I was in college that printed beautifully, but when I bought my MacBook, it came with a free printer valued at $100. I chose an HP PhotoSmart. I installed it, gave birth 2 weeks later, and when I went to use it about a month later, I found it leaked ink inside. It kept shutting down randomly, giving me error messages. I hated it. I spoke with Apple, explained I was on maternity leave so I couldn't return it within their return window, and they were very nice and let me switch. I opted for a slightly more expensive (only an additional $50 out of my pocket over the free $100) Epson WorkForce 630. I've been SO happy with it. It printed gorgeous photos, it printed my Project Life digital cards perfectly, it worked with card stock and was wireless. I could even print from my phone using Epson's app. But a few weeks ago I started getting these bright green lines through my photos. I tried everything - cleaning, changing all the ink cartridges, every suggestion (beyond ordering a $40 cleaning kit) I could find online and nothing helped. When I eventually seemed to get rid of the green lines, I'd get the banding. Yet when I ran a print head alignment and nozzle check, they came out fine. I can still print black & white documents without issue - but my color photos and color card stock prints have banding. It's acceptable for general use but not for my standards for crafting/scrapbooking. I had to weigh what was important to me. Did I want an expensive professional photo quality printer, when I wasn't doing physical Project Life anymore and could easily order prints from Walgreens or Snapfish? 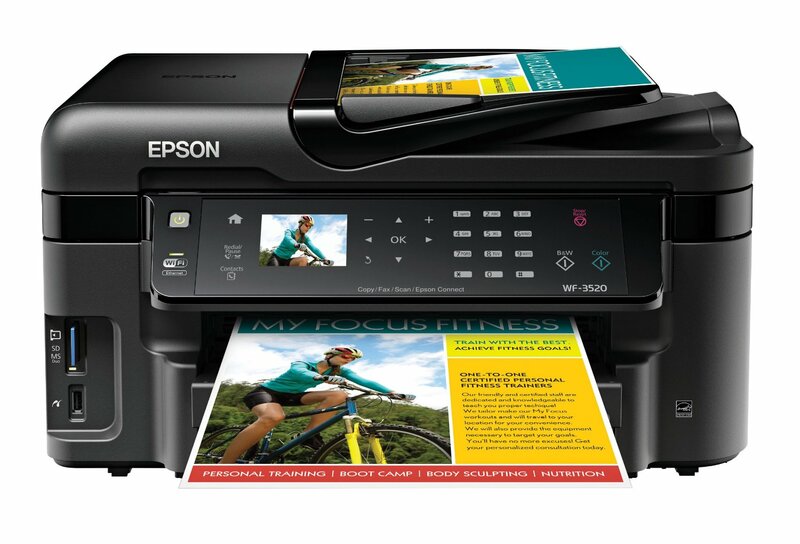 Did I want a cheap all-in-one plus a dedicated 4x6 printer, like an Epson PictureMate? I knew for certain I did not want a Selphy. I do not like that the prints are not a full 4x6 size, and I don't like the whole ink/paper combo thing. I have also heard of trouble getting it to work correctly. In the end, an all-in-one was the right choice. I didn't want two printers and I couldn't justify the money on a professional level photo printer. I did a lot of research on what printer to upgrade to. I read hundreds of reviews. I looked into Epson and Canon (staying away from HP because of past experience). I wanted a reasonably price printer that could do photos and card stock and regular paper, and copy/scan. After all of my research, I settled on the Epson WorkForce 3520. It is a few years newer, but uses the same ink cartridges as my 630. (A bonus since I JUST bought ink - and I get the high capacity cartridges, which generally last me 6 months or so, even when printing photos, so it wasn't cheap). I'd thought about the Canon Pixma printers, but reading reviews online and comparisons didn't prove they were any better than the Epson I chose. And I could not afford one of the Pixma Pro printers. Since I'm comfortable with the Epson line, I think this was really the best decision for me. And I only paid 119.99 (actually, free with Amazon gift cards) with free Prime shipping. (This isn't showing as an option right now, but I only ordered last week - I imagine when Amazon gets them back in stock they'll add the prime again). Initial thoughts on this printer - I love that it's about the same size as the one I had. A little smoother curves and a nicer, smoother paper tray. I printed a photo and I'm getting gorgeous prints again. Are they professional prints? Of course not. But they're at least equal to CVS/Walgreens quality if not slightly better. That's perfect enough for my needs. It's got a touch screen as opposed to buttons on the 630. It also has a rear feed tray for envelopes and single sheets. You can't put 4x6 photo paper in the rear tray but you can put a full sheet of photo paper, I read. Overall it looks pretty much the same, but newer and a little nicer. Setup was clear and easy too - everything is clearly laid out in the quick start guide. I downloaded the driver off of the Epson site (too lazy to use the included CD) and that went well. Everything installed perfectly on my Mac and it easily connected to my wifi network. Hi, Thank you for you review of the epson WF3520 printer - I am in the market for a new one too and this was on the list of possibilities. I also do Project Life and would like to print my photos from home (like you I also print at the store when i have a big batch or large photos). Can you tell me how many 4x6 prints you think you get (roughly) from 1 set of cartridges? I don't think I can answer that, unfortunately I use my printers for more than photos. I print journaling cards, and a lot of paperwork. All I know is I replace my ink about 2 times a year.